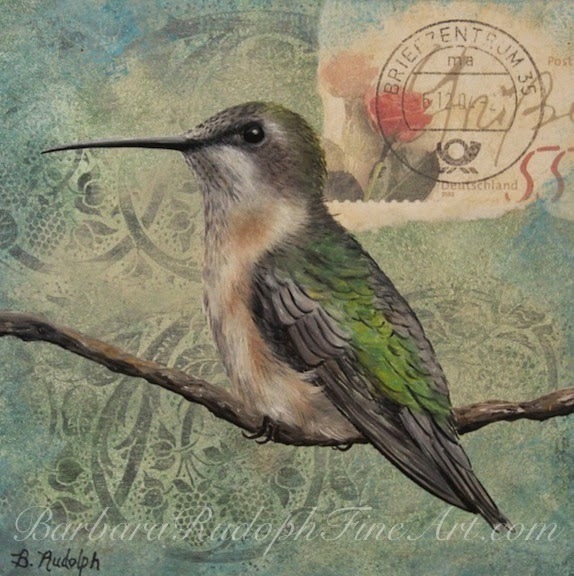 "Hummingbird painting with Deutschland Postage Stamp"
This new mini oil painting features a little "hummingbird" on a colorful background. It includes an old postage stamp from Germany. I thought the stamp was beautiful and would help create an interesting background. It measures only 4 x 4" on a canvas panel. I am working on a group of small oil paintings with fun and colorful under-paintings for my fall and winter shows. This is the first one in the group. There is a lot of debate over the idea that there are "no hummingbirds" in Germany. Some birders claim that it would be big news to find a "hummingbird" on the European continent ... although..... they have found ancient fossils there. Hummingbirds in Europe? While the only hummingbirds you'll see flying around Europe these days have probably escaped from captivity, hummingbirds lived wild and free in present-day Germany and in other parts of Europe, Asia and Africa more than 30 million years ago. A scientist discovered fossilized bird skeletons from Germany that are the world's oldest known evidence of creatures that looked like today's hummingbirds. Finding these bones in Europe is especially exciting. They are the first bones with a modern hummingbird design ever found outside of North, Central or South America. These European hummingbird skeletons measure about 4 centimeters (about an inch and a half) from head to tail. They have long beaks and wings designed for hovering, says Gerald Mayr, the scientist who identified the bones. He works in a natural history museum in Frankfurt, Germany, called Forschungsinstitut Senckenberg. You can’t take anything for granted anymore. Hummingbirds, for instance—like the Bay Area’s permanent-resident Anna’s, spring-nesting Allen’s, and migrant rufous. There are about 340 living species of these small, hyperactive, nectar-feeding birds, and they’re all found in the Western Hemisphere. Their greatest diversity is in the Central American and northern South American tropics, leading biologists to conclude that the family evolved there before colonizing the temperate regions. 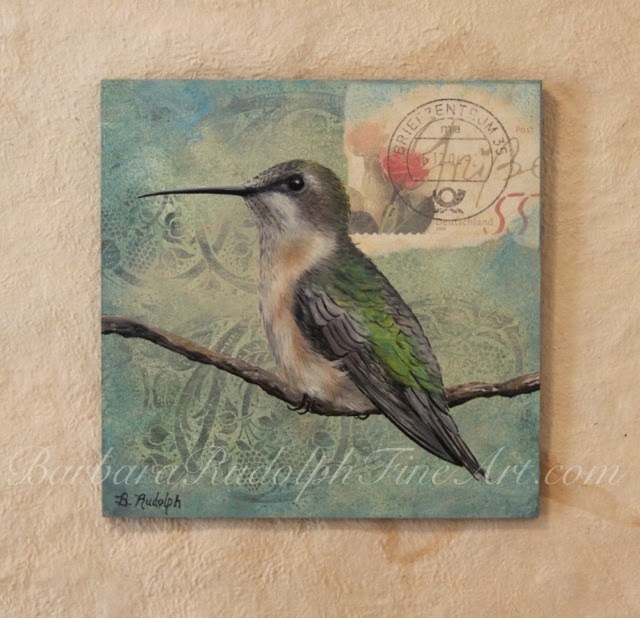 Hummingbirds were always thought to be as American as succotash, or ceviche. Not so, says ornithologist Gerald Mayr of the Senckenberg Research Institute in Frankfurt. Hummingbirds are from Germany. In a recent issue of Science, Mayr described a 30- to 34-million-year-old fossil discovered in a clay pit in the German state of Baden-Wurttemberg. The tiny skeleton is almost identical to that of a modern hummingbird. Its needle-like beak is more than twice as long as the skull; its wingbones are modified for hovering flight. Mayr named his find Eurotrochilus (“European hummingbird”) inexpectatus. Inexpectatus is an understatement. “My mind is a little blown,” commented one American biologist. Hummingbirds, like most small, delicate-boned vertebrates, have not left an extensive fossil record. The oldest unequivocal hummingbird remains, from Central America, date back a mere million years. Mayr has claimed other specimens from 49-million-year-old deposits in Germany and 30-million-year-old sites in the Caucasus as protohummers, but these are less complete than Eurotrochilus and appear to have been in some ways more like swifts than modern hummingbirds. The new discovery seems to clinch the case for the European ancestry of hummers.